Sunway College’s A-Level Math and Logic Challenge organised for the sixth consecutive year this year was nothing short of success as myriads of students from all over the country showed enthusiasm during this challenge. The competition was divided into Round 1, an individual test with multiple choice questions and Round 2, a team challenge. The stiff competition saw 21 students emerge as winners for Round 1 with the highest scores. 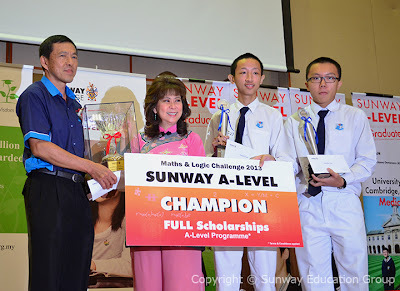 All the winners received Sunway A-Level bursaries, individual trophies and certificates of commendation. The champions of the competition with Elizabeth Lee, Senior Executive Director, Sunway Education Group and teacher, Tan Bak Chuan.